Today I am happy to have Marni of Creative Custom Card Boxes joining us. Some of you may remember the Recession Friendly Wedding Event held in NYC recently. As I wasn't able to attend, I've asked Marni to stop by and let us know about the event, along with some great wedding budget tips that the participating vendors shared at the 2-day event. So, let's see what Marni has to share with us (along with photos from the event taken by Marni herself) . 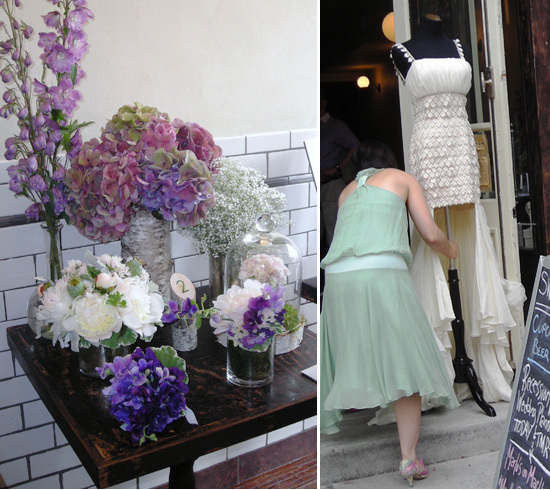 . .
On June 13th and 14th, 2009 I was pleased to participate in a lovely little wedding event in New York City’s West Village. A little cupcake, wine and beer place called Sweet Revenge hosted the event. This unassuming storefront hides a charming little eatery featuring quiches, scones, and of course the famous cupcakes. I must tell you readers, that the "Sweet Revenge" cupcake is the best I've ever had. A concoction of spiced cake with chocolate oozy ganache filling and peanut butter buttercream frosting, it was absolutely to die for. But I digress, we're here to blog about a wedding event! The idea behind the event was to give fashion conscious brides the chance to meet vendors who could help achieve their high style vision at a recession friendly price. The vendors all donated a prize to go in the Grand Prize Gift Basket which one lucky couple will win. 1. Denise Fasanello of Denise Fasanello Floral Design uses found objects in her floral arrangements and as vases to help keep the costs down. As you can see in the picture, big blooms can make a BIG impact while still keeping the budget easy on the wallet. 2. Janelle Funari who designs the Orangia Collection of Bridal Gowns showed that wedding gowns don’t necessarily have to come from the big couture houses to be beautiful. Her free flowing, vintage inspired creations help to create a mood and make every bride feel special on a recession-friendly budget. 3. Scissor Paper Stone’s Robin Goldsmith showed that you can create a fun and elegant tone for your wedding all starting from your Save The Dates and Invitations. Personalized stationary doesn’t have to necessarily cost more than the pre-made invites you see in the books. 4. Of course, my mother Linda and I (of Creative Custom Card Boxes) think that using a custom card box for your wedding can help to really personalize the event in a sophisticated way. But sophisticated and personalized does not have to be expensive. By using eco-friendly resources and other means, we keep our costs down and transfer those savings to you. 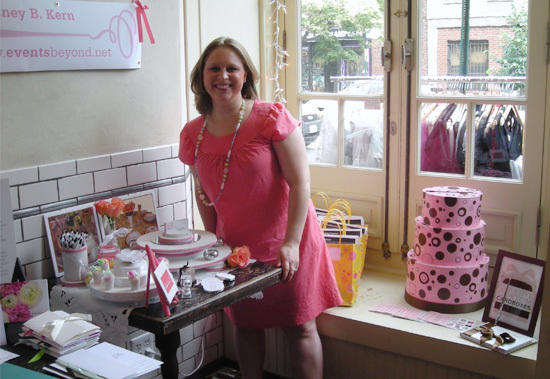 I also had the pleasure of meeting some great wedding bloggers who showed up to the event. The lovely Lisa (find her on twitter here: @bridalease) interviewed the various vendors and gave her perspective of weddings in NY. Here is her blog. I also was pleased to meet Bee Kim of wedding website Wedding Bee. (find her on twitter here: @bee_kim). She was so sweet and took time to speak to every single vendor. Weddings CAN be recession-friendly. Using local vendors who you trust can ensure that you are getting the best quality for whatever the budget. When planning her own wedding, Marni sought a card holder that matched her theme without breaking the bank. She found that the options available were either too gaudy or tacky and were very over priced. She and her mother Linda decided to create a custom painted card box to match her color scheme and theme. The mother-daughter team behind Creative Custom Card Boxes works closely with each of their customers to create a card box that is perfectly in tune with her wedding or party theme and decor. The boxes start at just $40, which is absolutely amazing, considering the time and effort that goes into creating such beautiful finished products. Creative Custom Card Boxes recently received the prestigious Brides Choice Award from WeddingWire.com for 2009! They have also recently worked on a Celebrity Wedding Card Box! See their blog for more information. Linda and Marni of Creative Custom Card Boxes create hand crafted and hand painted gift holders, cake table "I DO and WE DO letters, and monogram caketoppers which can be completely customized for weddings and other celebrations. Check out www.creativecustomcardboxes.com for more information. Thank you so much Marni for joining us today and providing a re-cap of the Recession Friendly Wedding Event for my readers. And, don't forget, today is the last day to enter and win a custom card box from Marni on Best Wedding Sites.